We started our day very early at 5:30 am and walked over to the Kyoto Station to see a rare sight; an empty station. The station soon came to life as early workers and students began commuting. We traveled via the Shinkansen to Hiroshima to see the Hiroshima Peace Museum. It was a powerful experience for myself and my classmates. In class, we read about the racism and hate-mongering exercised by both Americans and Japanese toward each other during World War II, that lead to wartime conduct that was savage, dehumanizing and merciless. It was moving for us to see the destruction that the atomic bomb had caused to Hiroshima. 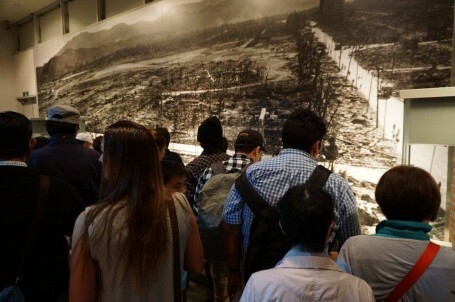 The museum displayed artifacts – clothes, rubble, skin – and the names and short biographies of the victims, which made the experience much more personal. 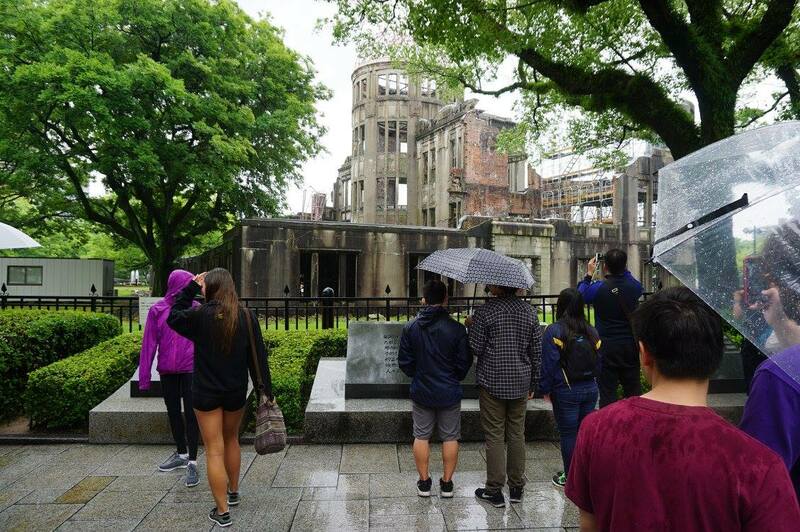 The Genbaku Dome, a UNESCO World Heritage site, was one of the few structures left standing in the central area where the atomic bomb was dropped on August 6, 1945. After Hiroshima, we enjoyed traditional obento and lighter conversation. We took the train and a ferry to Miyajima Island. There, we were pleasantly surprised to see deer roaming peacefully around the island. While signs advised us not to touch the deer, they were very easy to approach and observe up close. In addition, Miyajima Island is famous for the Itsukushima Shrine, an iconic landmark and a UNESCO World Heritage site. The famous torii (traditional Japanese gate) found at the entrance to the Itsukushima Shrine and symbolizes the transition from the profane to the sacred. During low-tide, the water recedes and you can walk through the gates. 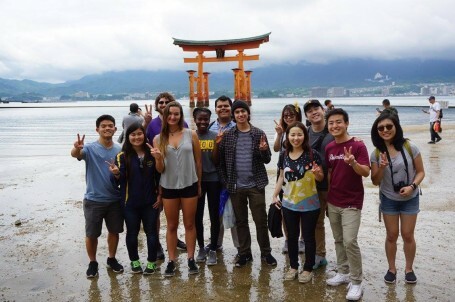 There was much to enjoy on the island and as a class we visited various shrines, shopped for omiyage and feasted on grilled oysters, okonomiyaki and the region’s famous maple leaf shaped manjū. We spent some time relaxing and meditating at a shrine and found the respite very calming to be surrounded by Miyajima’s natural beauty. After a long day of traveling, we returned via the Shinkansen to Kyoto. We were fortunate to have 7-day JR Rail passes because it made travelling by the Shinkansen and other JR trains much cheaper for us. I realized that even though it might be cheaper to take a flight across Honshu (main island), the Shinkansen is much more convenient – there is no TSA, times are exact, you can take anything with you and it is really easy to sleep because there is so much leg space! We were really lucky to travel across Japan using such an iconic mode of transportation. 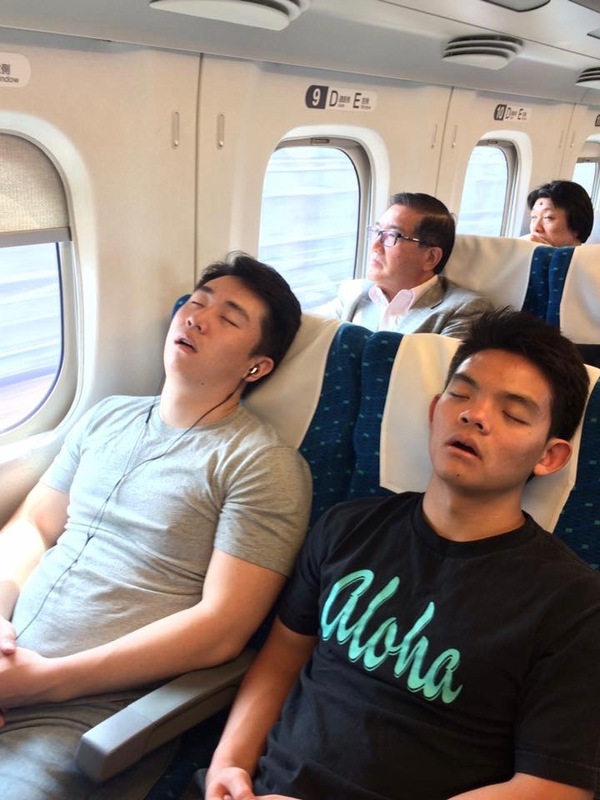 Rio, our TA, caught Alex (left) and me (right) sleeping on the Shinkansen. When we returned to our Kyoto hotel, many of us made our plans for the following free day to explore Kyoto’s rich history! This entry was posted in Culture, Exploring, Kyoto/Hiroshima by geajapan. Bookmark the permalink.